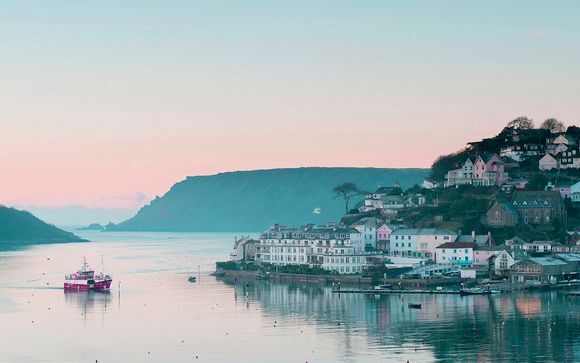 In the beautiful coastal town of Salcombe, the hotel’s lounge has stunning views from every window. The popular market town of Kingsbridge is 15 minutes' drive from Salcombe Harbour Hotel. Dartmoor National Park is just a 30-minute drive away and Plymouth city centre can be reached in 50 minutes' drive. Famed for its sailing waters, Salcombe Estuary is the perfect way to take in the scenery and reach secluded coves. Whether you are a seasoned sailor or just getting started, sail in an Area of Outstanding Natural Beauty on the south coast of Devon. Salcombe Harbour Hotel even features its own private moorings for its seafaring guests. After a day on the water, it’s back to the hotel for Gin & Tonic on the terrace as the sun goes down. 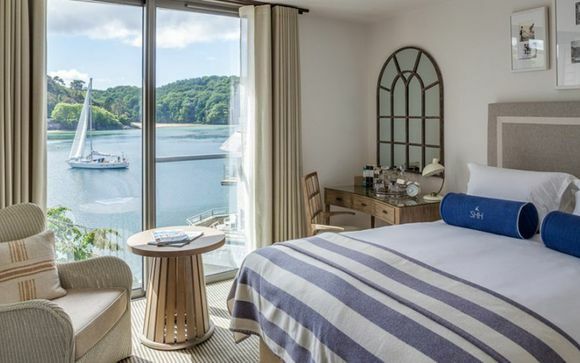 Selected by The Times as one of the "coolest places to stay in 2013", Salcombe Harbour Hotel & Spa is already being recognised as one of the UK's most desirable waterside destinations, with an incredible location and facilities. A recent multi-million pound refurbishment has created this chic new luxury spa hotel on the edge of Salcombe Estuary, complete with a coastal retreat spa, private cinema, waterside restaurant with wide outdoor terraces, all taking in the panoramic vista, overlooking one of the most dramatic coastlines in the UK. Wake up to exceptional views across the Salcombe estuary, as you slide open your balcony doors and breathe in the fresh Devon sea air. Head off to explore the coastline, before returning to recline on the rooftop terrace, looking out across the water as the yachts sail by. 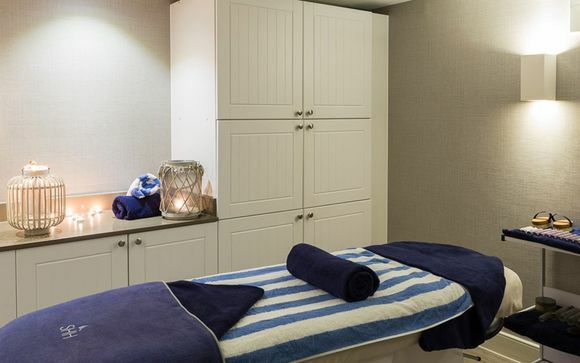 Why not treat yourself with a massage at the luxurious Harbour Spa. This offer is based on an Estuary Glimpse Room. These double rooms feature a Juliette balcony, with partial estuary views. Simply slide open the wide glass doors, breathe in the fresh sea air and enjoy the unrivalled views. Guests in every room enjoy the use of a touch-screen tablet, providing free internet, your in-room directory and a range of concierge services. The Hotel’s stylish new restaurant, The Jetty, takes full advantage of its waterfront location, with award-winning chef Alex Aitken creating a mouth-watering menu. Serving local and seasonal dishes, with fish landed daily and a local larder of delicious seasonal produce on its doorstep, The Jetty offers an exceptional dining experience. Sunken into the cliff side, the Harbour Spa is lavishly spread out over two floors. Featuring five treatment rooms, fitness suite, indoor pool, Jacuzzi, sauna, stream room and relaxing pebble room, guests can curl up in a private poolside cabana, reflect in the swimming pool’s submerged seating overlooking the estuary, or bliss-out with an indulgent ESPA or Harbour Signature treatment. Unique to the Salcombe Harbour Hotel is their very own 3D cinema room, complete with a 93" screen and 16 comfy seats. With three screenings per day, and a range of films available, you can kick back and relax with a glass of wine and they'll even provide the popcorn! From the A38 Exeter – Plymouth dual carriageway take the A384 road to Totnes then follow the A381 which is the direct route to Kingsbridge and on to Salcombe. On entering Salcombe carry along Main Road, do not take town signs. Follow this road down hill into Bennett Road, after 1/4 mile the hotel is situated on the right.